Cyber Monday shoppers who can't wait until Monday to snap up popular tech items online at special prices need not worry. Some retailers were making deals available Sunday. Amazon and Best Buy were starting the Internet frenzy a day early, similar to how some retailers opened stores for Black Friday shopping on Thursday. Amazon, which says Cyber Monday was its best-selling day last year, will be adding new deals to its Cyber Monday site all week long. Last year on Cyber Monday, Amazon sold a mind-blowing 158 items per second. For tech lovers, it appears there will be plenty of deals on electronics available, although Amazon is staggering the ones it opens up to customers. 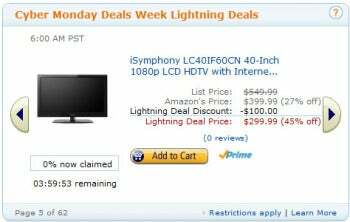 For instance, on Sunday morning, it offered a 40-inch iSymphony HDTV with Internet apps for the "Lightning Deal" price of $299.99, or 45 percent off the list price. That particular deal only lasted a few minutes before it was 100 percent claimed and had a full waitlist. That means if you're in the market for tech items you should check the site early, find out when deals will open for buying, and set your clock to get in on the action right away. Beyerdynamic MMX 101 in-ear headphones, normally $89.99 at Amazon, also sold out quickly for $60.99 but at least initially still had room on a waitlist. By late morning, a little more than half of the i.Sound Portable Power Max units on sale were still available for $59.99, 54 percent off the list price, and a 14-inch Hewlett Packard laptop was about to hit and site visitors were told to check back according to a countdown to get the discounted price. Amazon's strategy to tempt visitors with good deals on electronics, but not give them access to all deals at once, is a pretty smart trick to keep people returning again and again to the site where they could find even more items to buy. Best Buy also is promoting its online Cyber Sale, which it says is Sunday and Monday, as opposed to Amazon's week-long event. Its carrot for shoppers is also different -- if you spend $100 or more and use in-store pickup Best Buy will e-mail you a $10 electronic gift card you can use online or in stores. Best Buy also doesn’t show you how much of a discount you’re getting when you put an item in your shopping cart, so it will help if you know the normal selling price of any items you might want to buy.